Go ahead! 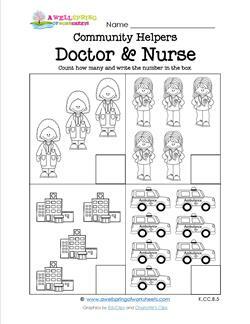 Add some community helpers to your math lessons! 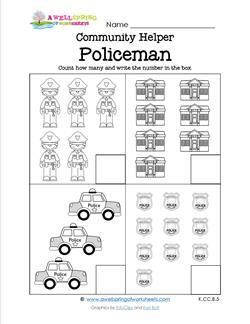 These community helpers count how many pages have up to 10 objects neatly arranged in each set. Most have four sets per page, but some have six. 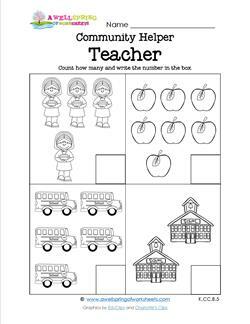 Kids count the objects that correspond to the community helper on that page and write the numbers in the boxes. Objects include items like a policeman’s badge, a batch of vegetables for a chef, a hospital or school house, a cat, a dog and a bus. Coloring is extra! Answer sheets included. 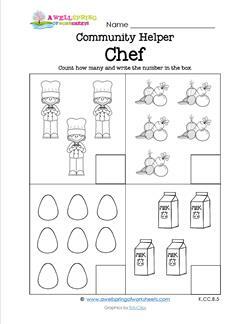 Chefs are great community helpers that usually work behind the scenes. Can you spot the chef in your local eatery? Count the chefs and the foods they use. Who helps you get better when you're sick? That's right the doctor & nurse. Count and color! Farmers are the community helpers that grow and harvest good food. 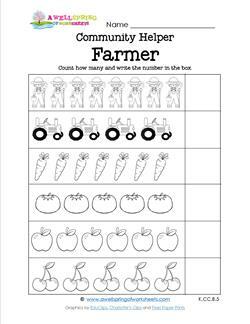 Count the farmers, tractors, and fruits and vegetables. Then color! Firemen to the rescue! 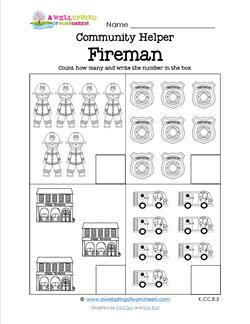 Count these important community helpers as well as their badges, fire trucks, and fire stations. Color for even more fun! How many policemen do you see in your city? Count these community helpers, their badges, police cars, and police stations. 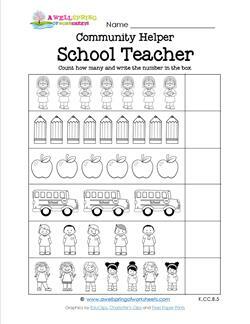 This community helpers counting worksheet has 6 sets instead of just 4. Count the teachers, pencils, apples, buses, and students. Teaching is definitely a helping profession. Helping kids to read, write and more! Count the teachers, apples, buses, and schools. Not everyone who loves animals will become a vet, so these are special community helpers! 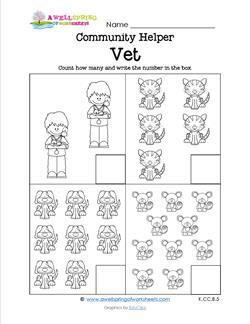 Count and color the vets, the dogs, cats, and mice.